Sardinia is the second largest island in the Mediterranean and is most well-known for it's beautiful blue waters and rich culture. It's the perfect romantic destination if you are travelling as a couple, but visiting with children is great too. There are plenty of activities to take part in and family fun to be had during your stay. Authentic Sardinia cuisine takes influence largely from Italy, and is home to some of the best restaurants in the world. 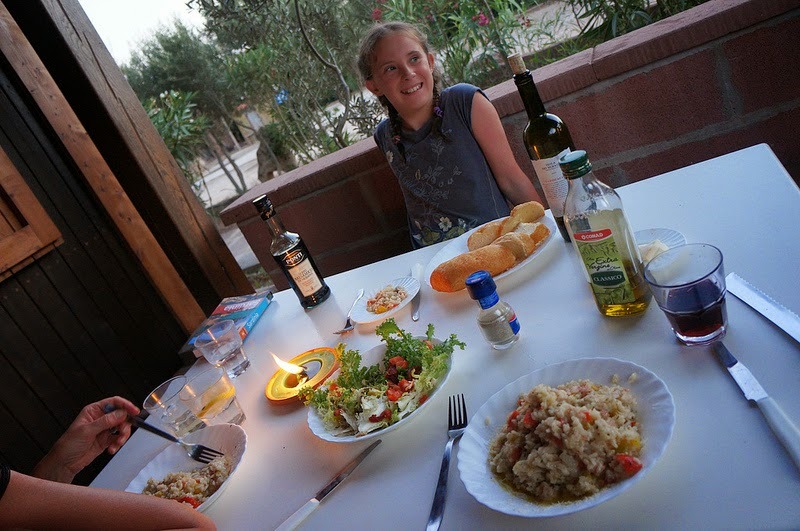 Guests visiting with children, should have at least one meal at Bimbis off the beautiful bay of Chia, where children can have a buffet tailor-made for them and learn about all the foods they are eating at the same time by specially trained chefs. Mum's and Dads can sample the very best in authentic cuisine, such as local Malloreddus, a pasta made from semolina and saffron. It's ridged shape is designed to catch sausage and sauce. It's best served sprinkled with one of the many cheeses local to the region such as pecorino or if you are brave enough- maggot cheese. A soft cheese in which maggots are allowed to live in a lay their eggs to add depth of flavour. It's not for the faint hearted! If you are planning a day of sightseeing, it's a good idea to pack a picnic and take it with you, as it can cost a small fortune to feed a brood on the go! Sardinia is home to a diverse range of beaches, from rocky, coastal locations perfect for mountain bikers, hikers and sunset junkies to sandy white beaches, ideal for swimming and building sandcastles. The beaches here are known for being very clean and safe, so they are perfect if you are travelling with kids. Take to the South of the region for the very best beaches for sun worshippers. Porto Pollo, near Palau is in the North of Sardinia and is a well-known spot for both kite surfing and sailing. Guests can easily charter a boat if they wish too, and see the best of the tiny secluded islands and beaches off the coast of Palau. It's also well known for snorkeling, as it's crystal waters and dazzling white sand make it a perfect spot for underwater swimming. Sardinia is a great place to visit at any time of year, due to it's year round sunshine, but if you are planning a cheap holiday on a budget, avoid peak season (July and August), March- April and June- September as it is generally less hot and because most people visit in the summer, it's a much quieter time to visit. Have you been to Sardinia? With your children? What did you find were the best things to do?